I made a new friend last week. Despite being around him for the past several months, the reason he’s my new friend is because he was only just born a few weeks ago. Erin and I went to visit with our friends – the proud new parents – and with little Felix. He’s a charmer and I am obsessed with his little feet. 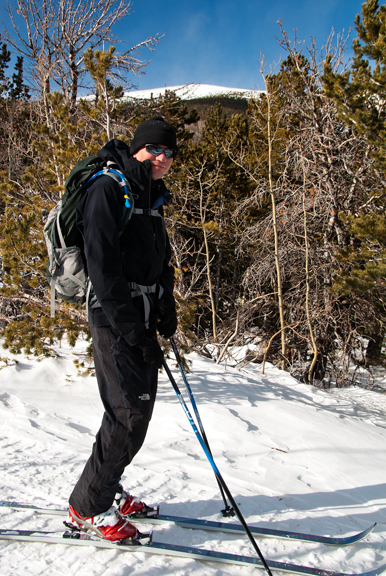 There was much discussion of how to craft some telemark skis for him. The past week we’ve spent more time on trails than at the big resorts because we are spoiled brats who don’t like skiing with crowds of holiday or weekend skiers. 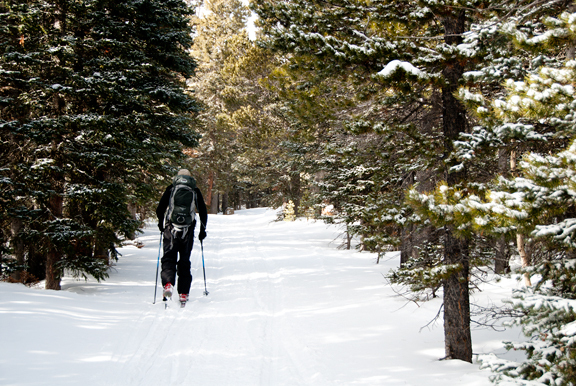 Plus, there is something to be said for the beauty and solitude of our local backcountry. 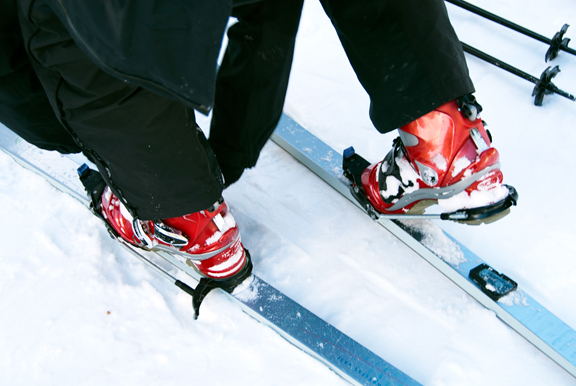 I know some of you will think skiing is skiing, but there are many flavors of skiing. I call this one “delayed gratification”. But really, it’s great exercise and a lot of fun. As some of my friends know, I had lost my Chinese cooking mojo for a while. I just wasn’t feeling it. Sure I could think of things to make, but I had no desire, no spark to actually want to make any of them. Then in the last few weeks, I’ve developed cravings for various Chinese dishes that I’ve only had in restaurants. Perhaps it is because Chinese New Year is just around the corner (next month) or because I’ll be seeing my beloved Chinese Grandma on my next trip to the Bay Area? Whatever the reason, I began scouring my Chinese cookbooks for a favorite recipe I had been wanting to learn to make for years: salt and pepper squid. It’s not like I own a million Chinese cookbooks, but I do have a handful that have served me well in the past. Not a single one had a recipe for salt and pepper squid… except for Jaden’s book. Oh, thank goodness for homegirl! The recipe was so simple – I knew it was the one. It was so simple that my mind lept over this activation barrier I’ve had for so long and I set to work prepping, cooking, and shooting. This is something we usually order when we are in California where the Chinese restaurants are good and plentiful. I tend to order those dishes that 1) I don’t know how to make 2) are too complicated to make at home or 3) are a mess to make at home. It’s an easy dish to whip up if you don’t mind the frying (I kinda mind the frying). I love this stuff, which is probably why I should only make it once a year on special occasions. The point is – I CAN MAKE IT AT HOME IF I WANT TO. Isn’t that one of the challenges of the home cook: to reproduce and perhaps rival what you get at a restaurant? My one caveat is to be sure and pat the squid dry as best you can. If there is any water/moisture when you fry them, they will pop and splatter and do all manner of rude things. The squid cooks quickly. We are talking seconds (60-90), so you need to be quick or else you’ll turn your squid rubbery. Work in batches and when all of the squid are fried and still hot, I like to toss them with a mix of chopped green onions and Thai bird chilis. The residual heat from the squid will release some nice spice and flavors from the mix. 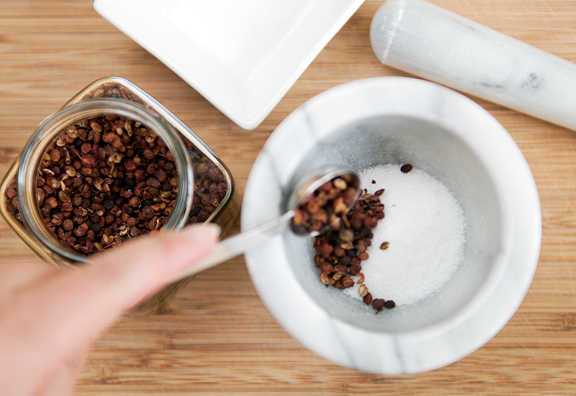 Don’t forget to sprinkle a little more Sichuan peppercorn salt before serving. I love the tentacles which curl up like tender little flowers and are a lot of fun to eat. If you haven’t tried squid like this, I highly recommend it. This is my favorite way to prepare and enjoy squid. 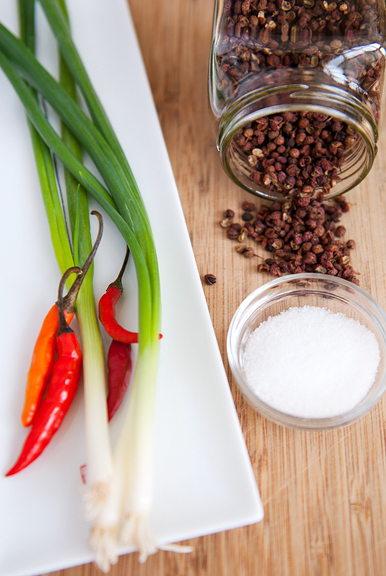 watch those thai chili bites – whew! 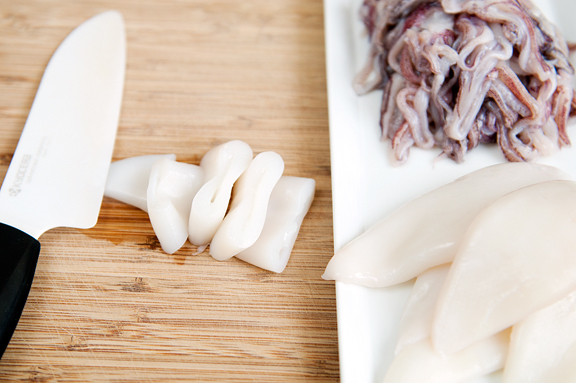 Slice the squid tubes into 1/2-inch thick rings (leave the tentacles whole – they curl up beautifully when cooked). Rinse the squid in water and pat dry with paper towels. The more you soak up any extra water on the squid, the less popping and spattering of hot oil you’ll have when you fry them. 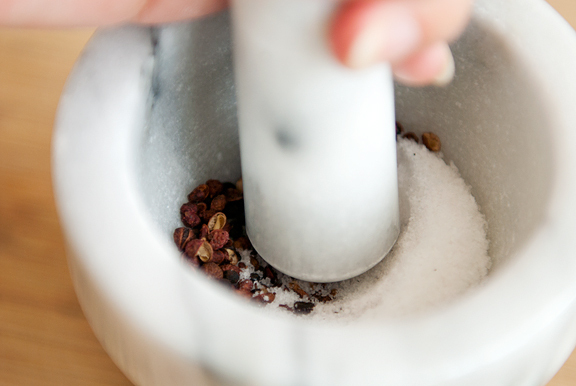 Crush the toasted Sichuan peppercorns and salt together to create a coarse mixture (I used my mortar and pestle). 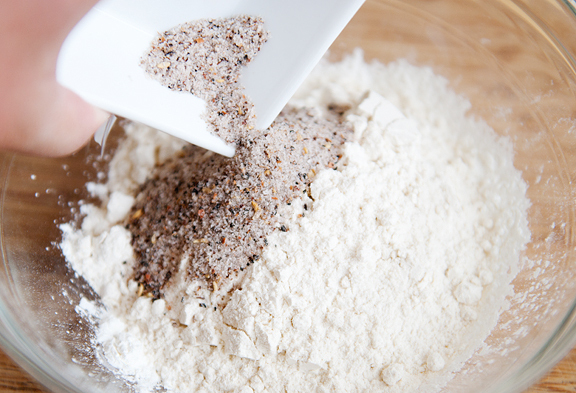 Combine four teaspoons of the Sichuan peppercorn salt (reserve the rest for serving) with the flour and cornstarch in a wide bowl. 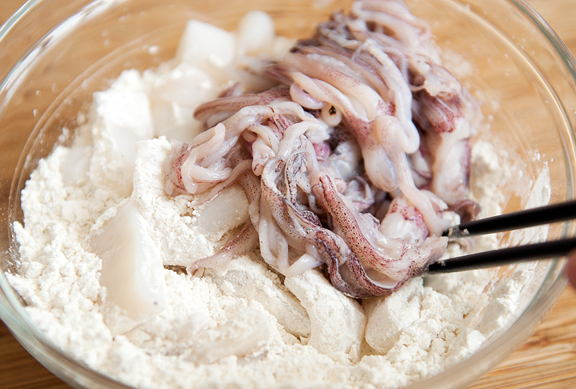 Place the squid in the flour mixture and toss until every piece is well-coated. 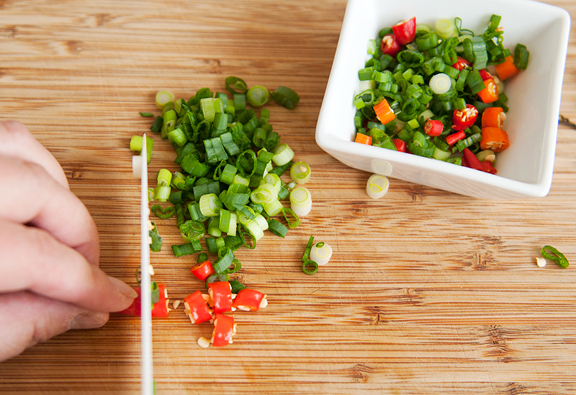 Mix the Thai chilis and green onions together and set aside in a large bowl. Heat about 1 1/2 inches of oil in a medium sauté pan or a wok over high heat to achieve a temperature of 375°F (190°C). With tongs or chopsticks, pick up some of the squid (no more than a fifth of the total) and shake off excess flour before lowering it into the oil. Fry until the squid turns a light golden color which takes between 60 to 90 seconds. Remove from the oil and set on a cooling rack to drain. Repeat until all of the squid is cooked. Toss the (still hot) squid with the chili, green onions, and remaining Sichuan peppercorn salt and serve immediately. Serves 4. Great looking recipe. The only way I have eaten squid is fried with a red hot sauce. I will try this. Thanks. Despite hating frying, your plate of squid looks perfectly battered and crispy! I better hide this post from Mr. B, or else he’ll be demanding it weekly =). One of my favorite dishes of all time! Gorgeous! 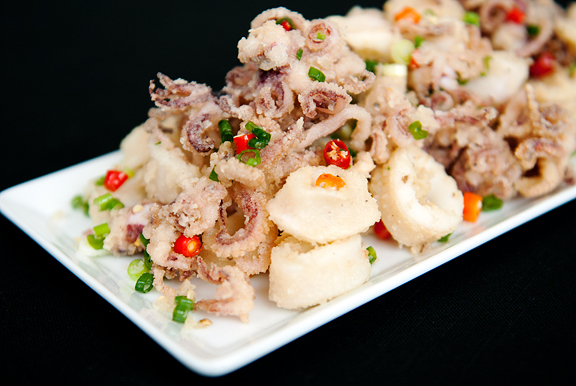 I don’t do deep frying, but that may have to change to make this Chinese Salt and Pepper Squid recipe! It looks fabulous! Oh my. I LOVE squid. My husband thinks it is mildly obsessive but doesn’t stand in the way. I agree with Phoo-D they little nibbles are perfectly battered. PS my sister-in-law lives in Alma and we have a bunch of friends that cook in Breck. I think of them each time you mention the area. small world! WOW. That looks and sounds completely fabulous!! I love this dish! Happy New Year! 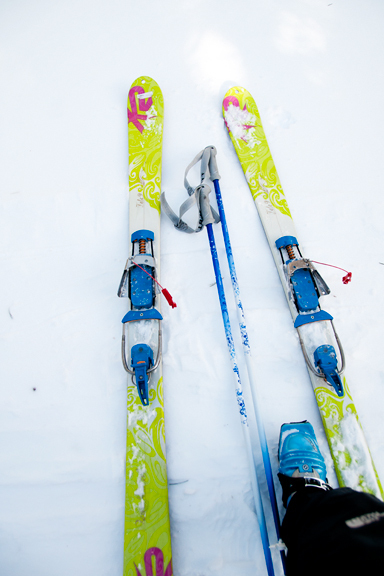 Little skis for adorable toes, awesome! Beautiful photos, and an interesting recipe, Jen. Your lovely post may change my mind. Wishing you good health and happiness! I don’t do too much deep frying either but I’ve made this recipe before and it’s really delicious. Gorgeous photos of the process, as always, and those toes…THOSE TOES! 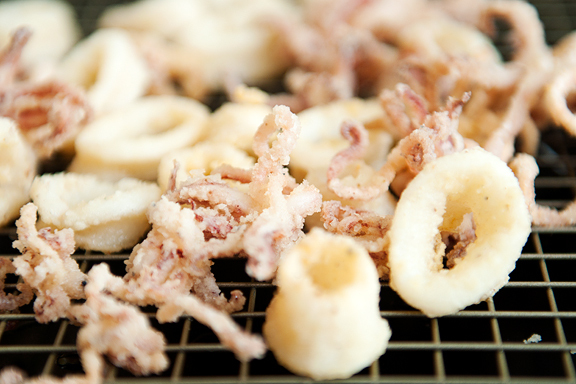 What timing — my kids gave me a deep fryer for Christmas and we LOVE salt and pepper calamari! Your step-by-step directions make it look entirely doable and delicious — I’m planning my grocery trip now. Thanks! I had this at Stokehouse Restaurant in St. Kilda, Australia. It was awesome, one of our favorite dishes! They served it on a garlic aioli. Can’t wait to try it at home. this is insanely appealing! It looks perfectly cooked. I just cannot wait to go to the farmers market this week-end to get some calamari to try this recipe! It looks like you had a wonderful holiday. Happy new year! My hubby loves seafood, especially squid – what a delicious recipe, Jen! I love salt & pepper squid too, but my favorite is salt & pepper pork. Do you think its the same technique substituting Chinese style pork spareribs for the squid? We first had both when we lived in Vancouver, BC. Now that we’ve moved back to the SF Bay Area we haven’t been able to find “the” place for either. Restaurant recommendations? Thanks for posting this! I love salt & pepper calamari or squid. We always have these whenever we had dim sum in Chinese restaurant if they were available. We also ordered salt & pepper pork for dinner if it’s avalable. Leelu, in Bay area we have had it at Peninsula Restaurant in Cupertino (south of Bay Area) many times. I believe that other Chinese restaurant may also have it. Oh wow, thanks for posting this! Is it similar to a dish I see on Chinese restaurant menus called “Spicy, Salty Squid/Chicken/Etc.” ? I’ve been looking for a recipe for something like this since I tried the Spicy Salty Tofu in Boston’s Chinatown. Do you think (with no disrespect to your beautiful-looking squid) that I could swap in chunks of firm tofu for the squid? Drooolllzzzz…..I would love to have a bite of this, like now…. if I can. I love salt and pepper everything. From tofu to squid. Yours looks gorgeous. I am craving some right now. It looks so good. How beautiful… and the very next thing I clicked on after reading this was an adorable illustration of Spicy Tuna with the cutest squid in it at They Draw and Cook (original illustrations & paintings of recipes by artists from all over the world) – gotta love it. I’ve been looking all over the place for this receipe! I’m so glad I found it. Thanks so much for sharing!! Y.U.M. This looks so, so good to me right now. I will definitely try this! looks scrumptious, jen! the squid, i mean. but also felix’s feet. It’s great your Asian cooking mojo is back. As a foodie who has serious tree nut AND peanut allergies (don’t worry I can eat lobster and strawberries), I appreciate all your recipes with the eye-watering details so I can cook and enjoy at home. I live in Vancouver BC and do you think I could find Mu Shu Pork wrappers? No-one at the bustling Asian market (including most of the sample ladies) had heard of Mu Shu pork let alone the wrappers. I guess coz it’s Mandarin origin, which is big in restaurants here, but not in the everday markets!! Anyway the moral of the story is that if you ÿoutube “Mandarin Pancakes” there is a delightful video by Leila from AsianCookingmadeEasy who shows the step by step procedure, and it worked and they were scrumptious with your Mu Shu Pork recipe. Not difficult to make especially as my husband is Ukranian and he and hhis sisters have trained me to make great perogy dough. Michelle – it *is* a small world! i have reconnected with several friends from far off places who live pretty nearby. Liz – awww, lucky YOU! 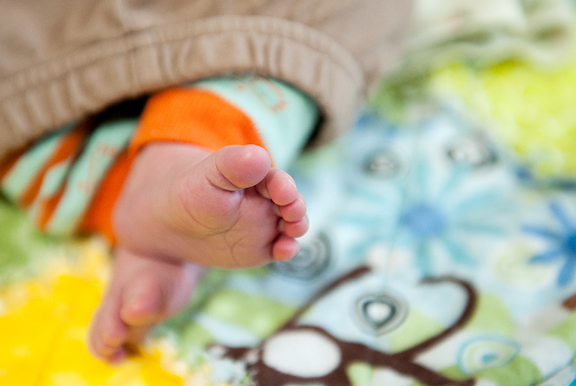 Patricia – he is super adorable and an incredibly good and sweet baby too. my friends are very lucky! salty spicy squid from victorias boston! now i can make it! my life is complete. I just made this using your recipe. It was my first time attempting squid from home. Amazingly simple and delish! I made this tonight. It was delicious and my partner who is from Hong Kong raved about it. It worked very well with frozen baby squid from the Hoo Hing supermarket as recommended by Gordon Ramsay. I also did somw stir-fried summer veg on the side…..